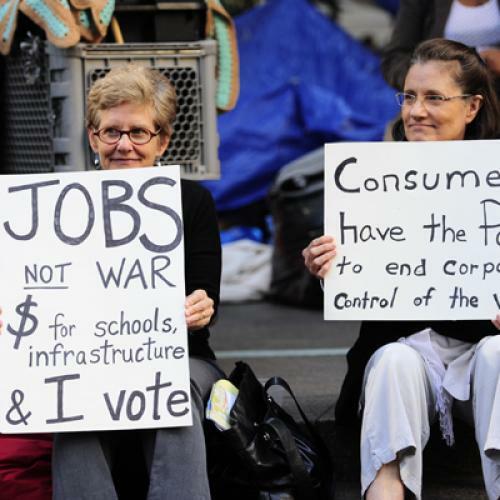 OWS Contemplates a Jobs Agenda. Crazy, Right? The plan would involve the federal government raising about $1.5 trillion in new revenue and using it to create 25 million new public-sector jobs paying union-level wages. It would put Americans to work building bridges, roads, and affordable housing; providing free public transportation and free university education for all; staffing a single-payer health care system; and pursuing clean-energy research. It remains to be seen whether the demonstrators will formalize this demand – or any other demand, for that matter. Forging consensus among anarchists isn't easy, from the sounds of things, particularly with all of that drumming in the background. But the the idea itself? It doesn't seem so crazy to me. If putting people to work is really your goal – and I believe it should be – then putting people on the government payroll would be an extremely effective way to do that. In the long run, obviously, you don’t want government doing things that the private sector does better. And, purely as a matter of principle, I think it’s good that people pay at least some token sum for public services and goods, if only to instill the idea that they cost something to produce or provide. So trufree tuition, transport, and health care is not something I'd embrace. But as a short-term strategy to boost employment temporarily, until the economy can get going on its own, why not put more people to work in public transportation – while deeply subsidizing its use, as Matthew Yglesias has frequently proposed? Why not hire people to staff clinics, to make sure the uninsured get care before the Affordable Care Act comes fully online? Why not invest in roads and bridges, which – in theory – something even many Republicans support? I confess I haven't done due diligence the economic arguments for or against this sort of initiative, just because it hasn't been on Washington's agenda. Maybe it's time I, or somebody else, does. Oh, I know: This Congress isn't going to enact a government jobs program. It's not going to act any government program, at least without a fight. But maybe talking about this idea, and its merits, will create political momentum for less controversial measures, like giving money to the states, so they can stop laying off so many teachers, first responders, and other employees. In case you haven’t heard, President Obama and his allies in the Democratic Party want to do that. In fact, Obama was in North Carolina today, making that very point. As for Occupy Wall Street, maybe they need a detailed jobs agenda and maybe they don’t. After all, the Republicans don’t have one, either. But they keep pretending that they do – and, as Greg Sargent notes, the media keeps pretending right along with them.